I know many successful women. They work hard, are intelligent, interesting and skilled people. Yet, often a theme that resurfaces time and again is women’s lack of confidence. It often manifests itself in a barrier to then pushing forward and getting to where they want to be, or a crisis of confidence in appearance. Much has been written about this, one of my favourite articles being this one from May 2014. A picture book, but not for pre-schoolers. It’s one of those titles I point towards as lasting throughout primary school and even beyond as a learning tool, as well as an enjoyable read. I even use it as a pep talk for myself on low days. 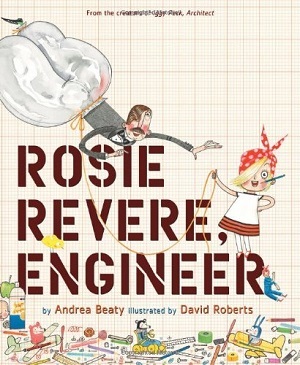 Rosie Revere dreams of being an engineer. But what I love most about this book is that it doesn’t contrast Rosie with ‘boys’ in order to make the point that girls can be engineers. In fact, for me, gender isn’t really the issue here at all – Rosie could be gender neutral – it’s about building confidence and persevering with something –for me it just suits my purpose in featuring a girl. Rosie is shy, but secretly likes to build and make models out of junk materials. The genius also lies in the fact that it mentions when she was smaller she didn’t have a lack of confidence but almost reveled in her fine inventions. As many toddlers grow into little girls, they do also start to lose that bravado. In the story, she makes her uncle, the zookeeper, a snake-deterrent hat, but sadly, he laughs at it, and by default, her. But Fred slapped his knee and he chuckled out loud. Come on, let’s get busy and on to the next!…. ….Life might have its failures, but this was not it. Her great great Aunt teaches her perseverance and pursuing of dreams, and Rosie stands proud next to her inventions. There are a couple of other things to point out here. In the last page, Rosie’s whole class are shown with their crazy inventions, boys and girls of all races, which is refreshing to see. On the final back page, barely noticeable, but there is a historical note, referencing the women who provided the workforce during the war effort – especially in the US represented by Rosie the Riveter, the fictional character whose slogan was ‘We can do it!’. I love that the author has referenced the time in which women really started to come to the forefront of the workforce – being indispensable and doing jobs that had previously been deemed suitable only for men. The vocabulary throughout is enriching and bold – from words such as perplexed to dismayed, and swooping and lingered. The illustrations are detailed and wondrous – there is lots to look at and inspect on each page – from the different patterns worn by the children, to the mass of material Rosie uses for her inspiration in building. This is a page to linger on for quite some time. And the text rhymes! This is a gem of a book. I cannot recommend it highly enough. See the Amazon side bar or purchase from Waterstones here. I don’t always like to recommend books by this pairing – not because I don’t love their books – I do, and could write a whole blog about them, but I often feel everyone already knows them, and some bookshops devote so much space to them, it can be hard to find all the other picture book gems hidden away at the back. Zog tells the story of a school of dragons learning their different skills year on year, from flying to breathing fire to rescuing princesses. Zog is the biggest dragon, and the keenest to learn. However, although keen, he often fails and hurts himself, and happens to be ‘rescued’ and tended to by a small girl called Pearl. The subversive ending is that Pearl is a princess who wishes to be a doctor, and doesn’t want to be saved by a prince, the prince wants to train to be a doctor too, and Zog chooses to be part of the ‘flying doctors’ crew, which Madame Dragon, the school teacher, regards as an excellent career choice. 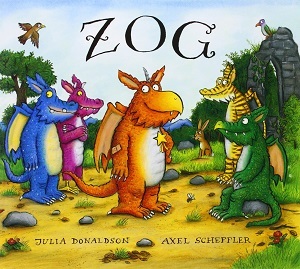 Zog stands out for me as a particularly interesting picture book. I love to use it when talking about girls and confidence for two reasons. Although Zog is the title of the story, there are two characters within who represent ‘girl power’ for me, and whom the children I read it with love more than Zog himself. Madame Dragon, who runs the dragon school, and Princess Pearl, who not only rescues Zog, and shrugs off her princess fripperies to be a doctor, but also in the end, hires the dragon as her transport, and trains the prince to be her junior doctor. Of course, as with all Julia and Axel’s books – the rhyming is pitch perfect, the illustrations are familiar, funny, friendly and detailed, and children love them. You can buy from Waterstones here. Another Pearl, but this one written with a clear agenda in mind. For this reason, I think it fails a little where the others succeed. It is not quite as polished – the rhymes don’t always scan perfectly. However, it is a useful and rather fun addition to this canon, particularly if like me, the advert Drive Like a Girl, tends to make you hit the steering wheel in frustration – no matter how they wish to spin it. but she had to be tough, it was time to be brave. This is one girl whose sense of self-confidence has already been instilled by her recently promoted Mum (the reason for Pearl’s moving and attending her new school). With thanks to @pbooksblogger for the suggestion. 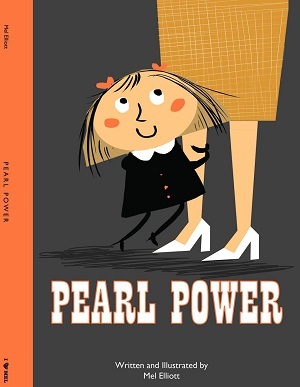 You can purchase Pearl Power here or through the Amazon sidebar.